Thanks to Sainsburies for this lovely recipe (and photo – I forgot to take one I was so hungry)! Gnocchi are basically small dumplings which can be made from semolina, ordinary wheat flour, potato, breadcrumbs or any similar ingredient. The ones you get in supermarkets tend to be made from potatoes. This will serve 6 people if you use a large squash and two packets of gnocchi. Two thirds of a 500g packet of gnocchi will feed two adults. 1. Preheat your oven to 200 degrees Celsius, fan 180 degrees Celsius or gas mark 6. 2. Place the chunks of butternut squash, red onion, garlic and rosemary into a large roasting tin. 3. Drizzle with olive oil and roast in the oven for 25 – 30 mins. 4. Whilst the vegetables are roasting cook the gnocchi according to the pack instructions (usually only 2 – 3 minutes at a rolling boil – you can tell if the gnocchi are done as they rise to the surface). 5. 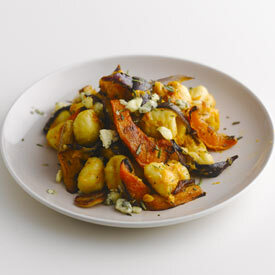 Drain the gnocchi and toss with the roasted vegetables, adding in the cheese. 6. Season with salt and pepper according to taste, adding extra rosemary if required. Entry filed under: food, recipes. Tags: blue cheese, garlic, gnocchi, recipe, rosemary. This sounds good, do you have any pics? Thanks for your comment! I’ve just added an image of the dish to the post. Hope you enjoy making and eating it. Oh, and the pic looks just as good. My sister also collects all the Sainsbury recipe card for me and gives them to me at Christmas, but I don’t think I saw this one. Is it new this year? Hi! There are dates of 25/08/2010 – 21/09/2010 on the back of the recipe card – I’m guessing this means when the card was displayed. It sounds like you will probably get it at Xmas from your sister! Cheers my dear. I look forward to hearing from you of your culinary adventure.